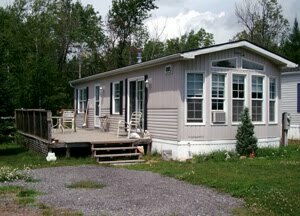 There is a great demand for trailer sites at Bare Oaks Family Naturist Park. There 14 members on the waiting list for a year-round campsite. But rest assured that we will continue to keep 25 sites for short-term use. That way, everyone gets a chance to spend a weekend or their vacation at the park. But if you want a year-round campsite, there are ways to get there faster. (1) Members who take an unserviced spot (no water, no electricity) get priority on the waiting list. (3) Finally, we occasionally make a larger, premium site available to the first person who purchases a new trailer through one of our preferred trailer dealers. That situation has just presented itself with site #105 in Helios Circle. It is a large site with year-round water, sewer connection and 100 amp electrical service. It is currently occupied by a unit that will be leaving. The site is available to the first person who commits to purchasing a new, peak-roofed, park model trailer from one of our preferred trailer dealers. If you are interested, please contact the office. We have introduced a video tour of Bare Oaks Family Naturist Park. A TV with 4 headphones has been installed in the office to show the video to visitors. Stop touring clothed people around the park – we have received a number of complaints about this. One person said it best: "it is starting to feel like a zoo and we're the animals on display"
Of course, you don't just have to be a visitor. Everyone is welcome to view the video. Just stop by the office and ask!